A one pot synthesis of alkyd resins based on the soya bean oil and glycerin with the zirconium octoate (zirconium 2-ethyl hexanoate) as a new renewable raw material has been observed. The alcoholysis reaction of soya bean oil and glycerin carried out in absence of nitrogen gas inlet in the presence of zirconium octoate. The alkyd resin was obtained after polycondensation of the alcoholysis products with phthalic anhydride at 250°C.The structure confirmed by FT-IR and H-NMR spectroscopy. A real possibility was determined for the synthesis of alkyd resins with some properties similar to those which can be found in equivalent products manufactured on the basis of semi-drying oil and glycerin like flexibility, drying time, hardness, adhesion test, impact resistance, gloss test and chemical resistance. The prepared resin was formulated in white lacquer and yellowing resistance tested with commercial resins. Alkyd resins make an important group of commercial synthetic polymers they are widely used in coating and paint industry and they have become essential raw material, which are used in the production of metals, wood and wood-based materials like furniture and floors, cement, cement-lime and gypsum plasters. The commonly used raw materials for the production of alkyd resins, besides plant oils like soya bean oil and linseed oil, are synthetic pentaerythritol, glycerin and phthalic anhydride which is toxic. Alkyd resins can be defined in brief as polyesters modified with fatty acids or fatty oils or with higher synthetic carboxylic acids. the molecules consist of a polyester backbone, which may be scarcely to moderately branched depending on the raw material selected, from which fatty acid groups project as side chains excess (free)hydroxyl and residual carboxyl groups are also present. The structure of an alkyd resin consisting solely of oil, additional glycerol and ortho-phthalic acid represented in simplified form. from the start of their industrial production in 1930. alkyd resins rapidly developed into the most important type of synthetic resin for coating chemistry. even today they still account for over 40% of world production of synthetic coating resins. The huge success of alkyd resins can be attributed–in short–to an ideal combination of polyester and oil properties. The polyester component is responsible for physical (surface) drying and weather resistance (gloss retention, freedom from yellowing, etc.). The oil component for the suppleness of the films (internal plasticization) and above all for the capability of oxidative crosslinking. The strengths of alkyd resins, such as self-curing at room temperature as one component system, very broad compatibility and solubility spectrum, virtually unlimited variability of properties by appropriate choice of raw material and synthesis condition, good pigment wetting, attractive flow properties leading to good readability of paints for example and relatively low cost . The oil type selected for the production of alkyds usually has a profound effect on the properties of the finished alkyd. the presence of fragments derived from unsaturated fatty acids in the polymer structure gives them the ability to cure chemically, solubility in the solvents used to manufacture varnishes, and the ability to blend with other film-forming substance alkyd resins will get cured due to intermolecular reaction of unsaturated bonds contained in the fatty acid chains and hydroxyl groups derived from polyols under the influence of oxidative polymerization initiators. Chain polymerization processes occur in alkyd resins to yield cross linking intermolecular bonds C-C and C-O-C [3,4]. Long oil alkyd always dry by oxidation and the high oil content promotes good flow, high flexibility and easy manual processing, but also leads to relatively slow drying, if conjugate oils or acids are used in the resin synthesis, rather faster drying resins are produced. Long oil alkyd based on soya bean oil used as sole film former for decorator paint , polyester amide and alkyd resins . These resins have application in different field such as paint, coating, adhesives and binders for composites. Vegetable oils and other green renewable raw materials are common sources in the organic coating industry, especially for alkyd resin synthesis in preference to petroleum products due to increased worldwide awareness of environmental concerns . Alkyd resins have acquired great importance because their economy, availability of raw materials, biodegradability, durability, flexibility, good adhesion and ease of application . The traditional oils such as soya bean, coconut oil, sunflower oil, linseed oil are used in the synthesis of alkyd resin [8-11]. 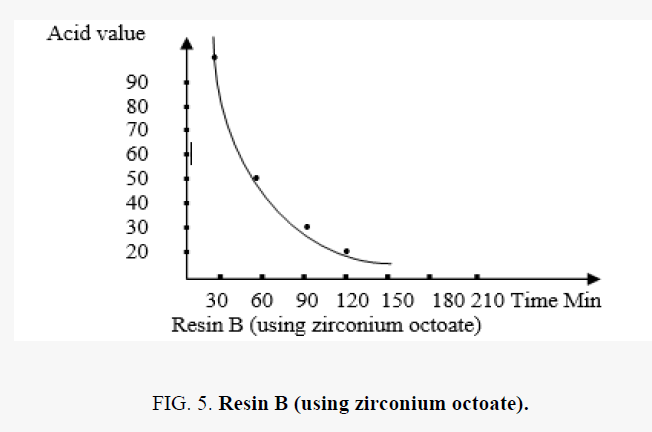 This paper describes the synthesis of alkyd resins which are based on the new renewable raw material catalyst zirconium octoate (zirconium 2-ethyl hexanoate) as new catalyst which act as base-catalyzed alcoholysis of soya bean oil. The zirconium octoate in alcoholysis reaction prevent oxidation of oil so the formation of monoglyceride by using zirconium octoate as catalyst in this synthesis useful for the color of monoglyceride. In this paper we studied physic-chemical and film performance properties which compared with commercial resin prepared. The following materials were supplied and used as received phthalic anhydride from egophoric company, soya bean oil from oil technology company, glycerin from ergophobia company, xylene, methanol, pot, Hydroxide, phenolphthalein from algophobia company, lithium hydroxide from Dr. Shahin chemical, cobalt octoate, zirconium octoate (18% mineral spirit), mineral spirit from trade company. Alkyd resins were synthesized using monoglyceride fusion technique , soya bean oil, glycerin and lithium hydroxide (as catalyst) were charged into a four neck round bottom 1000 ml flask equipped with a mechanical stirrer, condenser, thermometer. The temperature was raised by slow heating to 290°C-300°C. The monoglyceride is formed by the alcoholysis process, SCHEME 1. The mechanism of the base catalyzed alcoholysis of soya bean oil for monoglyceride formation is depicted in SCHEME 2[13,14]. The completion of monoglyceride process was monitored by testing the solubility of one volume of sample dissolve with two volumes of methanol to give clear solution where the triglyceride cannot dissolve in methanol but monoglyceride can dissolve in methanol, then the reaction mixture cooled to 180°C and phthalic anhydride was added to monoglyceride mixture. The temperature was raised to 240°C-250°C and maintained at this range. the reaction was monitored by periodic determination of acid value (AV)of the mixture to desired number (10-14) mg KOH/g of the resin. The alkyd resin synthesis is shown in SCHEME 3. the constituents of two resins along with some necessary characteristics are shown TABLE 1. This process was repeated with zirconium octoate as catalyst but the temperature used in the preparation of monoglyceride was 290°C-300°C and there was not nitrogen gas inlet where nitrogen gas inlet used only in the stage addition of ophthalmic anhydride to aid removal of water from reaction. in case of using lithium hydroxide as catalyst nitrogen gas inlet used in all stages of reaction. SCHEME. 1: Transesterification of vegetable oil by glycerin for synthesizing alkyd resin. SCHEME. 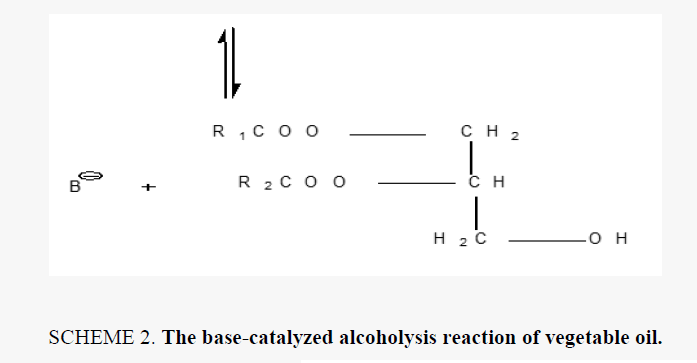 2: The base-catalyzed alcoholysis reaction of vegetable oil. SCHEME. 3: Synthesis of alkyd resin. TABLE 1. Preparation of coating films. To study drying time, hardness, gloss and chemical resistance. the two-alkyd resin applied onto cleaned glass plates of 100 mm × 100 mm × 3 mm the application was confirmed by applicator with slot width of 120 μm. for these tests, sample prepared at 55% solution of each blend in the described solvent system with drying catalyst in the following amount (100 gm of resin dissolved in mineral spirit (cobalt octoate, zirconium octoate). Adhesion, mechanical carried out on coated steel substrate. for this purpose, the cleaned steel plates were used. all coated plates were kept under stander conditions. Drying time test: Drying time was determined by “set-to-touch “and " tack-free " stages at regular interval of time. the test was confirmed according to ASTM D 1640(1995). Hardness test: All two resins were applied on glass plates and were allowed to dry for one week of application. the test confirmed according to ASTM D 4366(1997). Adhesion test: The cross-hatch adhesion test was performed on the coated steel plates after one week of application. The test confirmed according to ASTM D 3359(1997). Flexibility test: Flexibility of the dried films was evaluated using the mandrel test according to ASTM D 1737. the coated steel film after week of application were placed over the 118 in manderal with the uncoated side in contact with mandrel and was bent 180 degrees around it. the bended plate was examined visually for cracks or loss of adhesion. if the film passed through in mandrel then it was said to pass the flexibility test. Impact resistance test: The impact resistance was measured by falling weight impact procedure according to ASTM D 2794. The test was accomplished on the coated steel plates after one week of film application. Gloss test: The test was confirmed according to ASTM D 523 (1989) sixty –degree gloss reading was taken on each of the films after application in white lacquer. Chemical resistance test: The chemical resistance test was accomplished according to ASTM D 1647(1996), D870(1997) and D1308(1998) on coated glass and steel plates. after one week from application. Alkali and acid resistance tests were accomplished on glass substrate immersed vertically in separate beakers containing distilled water, dilute HCL (10%), aqueous Nacl (10%) and KOH (.4N) SOLUTION at room temperature. The samples checked by eye. the changes in appearance of the film at regular intervals within 1 day. The structure of two resin confirmed according to the FT-IR and H-NMR spectra for resin at 400 MHZ NMR spectrometer using CDL3 as the solvent. The alkyd resin synthesized by using lithium hydroxide and zirconium 2-ethylhexaneoate by alcoholysis process where soya bean oil undergoes transesterification when heated with lycerol at 250°C in case of lithium hydroxide as catalyst and nitrogen gas inlet until monoglyceride formed in case of the using of zirconium octoate the soya bean oil undergoes transformation to the monoglyceride by heating at temperature 290-300°C without any further oxidation and there was not nitrogen gas inlet. then esterification was carried out with addition of ophthalmic anhydride. the nitrogen gas inlet was used as inert blanket when catalyst was lithium hydroxide to prevent the oxidation of oil. nitrogen gas inlet was used in the second stage with zirconium octoate with addition of ophthalmic anhydride which facilitates the removal of water produced during condensation reaction. the reaction controlled by measuring acid value at different intervals of time. The reaction was stopped as soon as the desired level of acid value was attained. The FT-IR spectra of resin (A) showed in FIG. 1-3, where spectral data of resin indicate the presence of important linkage ester group, olefinic double bonds and other characteristic peaks listed in TABLE 2. The peak for C=O appears at 1735 cm-1 in case of synthesized resin. the peak at 3472 indicates the presence of hydroxyl group. FIG. 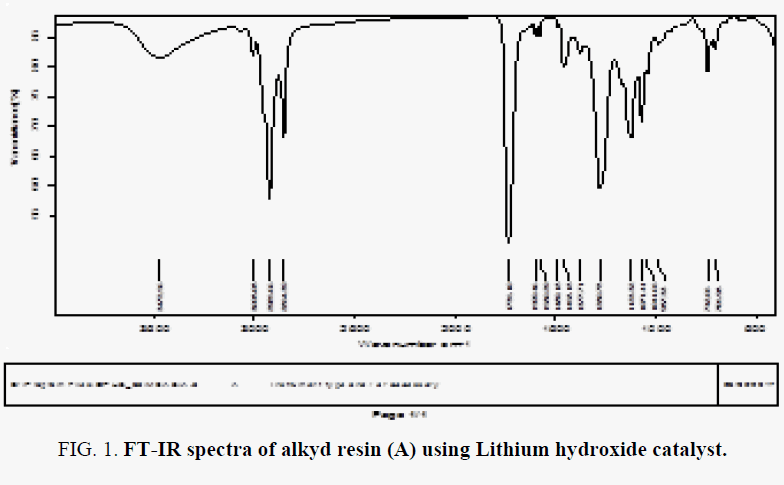 1: FT-IR spectra of alkyd resin (A) using Lithium hydroxide catalyst. FIG. 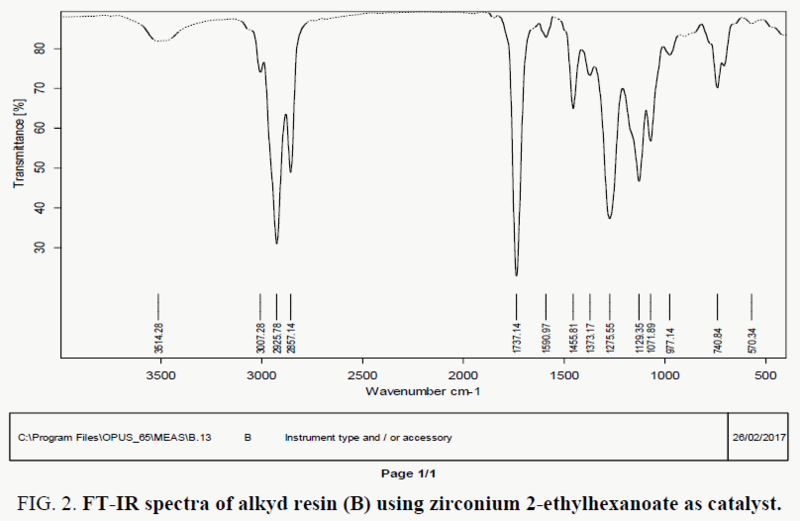 2: FT-IR spectra of alkyd resin (B) using zirconium 2-ethylhexanoate as catalyst. FIG. 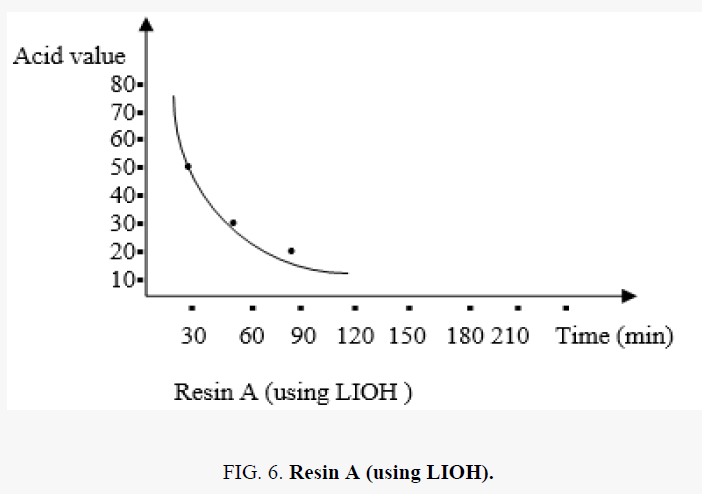 3: H-NMR spectra of alkyd resin A using lithium hydroxide (LIOH) as catalyst. TABLE 2. Characteristic peaks in FT-IR spectra of alkyd resin (A, B). FT-IR spectral data for resin (B) indicate the presence of important linkage ester group, olefinic double bonds and other characteristic peaks are listed in TABLE 2. The polyesterification reaction is confirmed by FT-IR analysis. C=O observed at 1737 cm-1. the peak at 3514 indicate the presence of O-H group, IR absorption peak at 1590 cm-1 for unsaturation of fatty acid and aromatic unsaturation. H-NMR spectra of the resin are shown in FIG. 4 and FIG. 5 for resin A and B which support the proposed structure. Peaks appeared at ∂.96 ppm for the protons of terminal methyl groups of fatty acids was confirmed by this peak. peaks next to that at ∂ 1.35 ppm are due to protons of all –CH2 present in the chain of fatty acid chain. Peak at ∂ 5.42 ppm due to the unsaturated carbon (olefinic hydrogen in the fatty acid chain). The proton of aromatic ring and xylene solvent used to dissolve resin can be depicted by peaks at the rang ∂ 7.00 – 7.78 ppm. peaks appeared at ∂ 6.95 – 6.97 ppm for –CH present in glycerol molecule linkage to oxygen of the ester group this may be due to the presence of anhydride groups. which results in deshielding effect. peaks appeared at ∂ 3.45 – 3.9 ppm for –CH2 present in glycerol moiety attached to –OH group in the resin. peaks appeared at ∂ 4.23 – 4-65 ppm for –CH2 present in glycerol moiety attached (phthalic moiety). Peaks appeared at ∂ 2.3 – 2.4 ppm for –CH3 attached to aromatic ring this due to xylene solvent present in sample resin. FIG. 5: Resin B (using zirconium octoate). 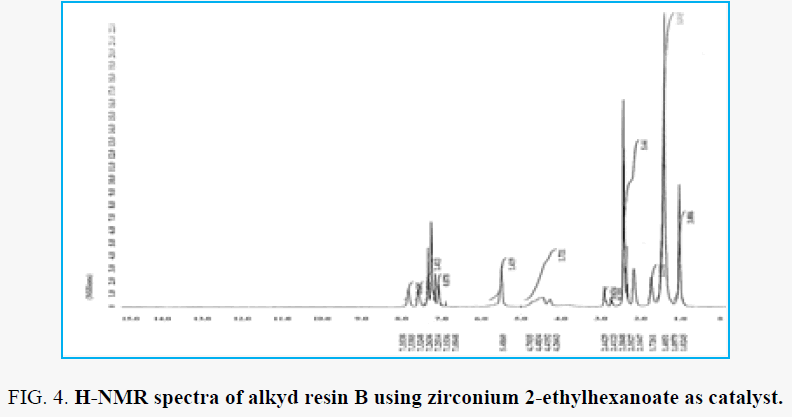 H-NMR analysis for resin B which the zirconium 2-ethylhexanoate used as catalyst for preparation the alkyd resin is shown in the FIG. 5 and FIG. 6. The proton of terminal methyl groups of fatty acids was confirmed by the peak ∂ 1.02 ppm. peak next to that at ∂ 1.40 ppm are due to protons of all –CH2 present in the fatty acid chain. peak at ∂ 5.48 ppm are due to the unsaturated carbon (olefinic hydrogen in the fatty acid chain). the proton of aromatic ring of phthalic moiety and proton of aromatic ring of xylene moiety at the range ∂ 7.15 – 7.83 ppm. Peaks appeared at ∂ 4.26 – 4.70 ppm for –CH2 present in glycerol moiety attached to (phthalic moiety). Peak appeared at ∂ 1.72 ppm are depicted to –CH2 group attached to ester group of zirconium 2-ethylhexanoate catalyst. peaks appeared at the range ∂ 2.32 – 2.44 ppm for –CH3 attached to aromatic ring this due to xylene solvent present in sample resin. peaks appeared at ∂ 7.05 – 7.08 ppm fo –CH present in glycerol molecule linkage to oxygen of the ester group this may be due to the presence of anhydride groups which results in deshielding effect. Peaks appeared at ∂ 2.68 – 2.91 ppm for –CH2 present in glycerol moiety attached to –OH group in the resin. FIG. 6: Resin A (using LIOH). Physical characteristic of dried films alkyd (A, B): This table described the time required to two resin dried where the first was set-to-touch and the hard drying of resin was tack free time. Results are given in TABLE 3. The results showed desired adhesion for resin A, B where two resin prepared from the same oil (soya bean oil) and glycerin which give the same polyester component which responsible for adhesion. TABLE 3. Desired adhesion for resin A, B. Mechanical and gloss characteristics of resin (A, B): The table gives the flexibility test results. the two samples passed the test, no cracking or peeling was observed this due to the oil content in the prepared alkyd resin. Results are given in TABLE 3. The results showed the hardness increase with using the zirconium catalyst than using the lithium hydroxide base in the synthesis of resin. this indicate when alkyd resin prepared using zirconium catalyst and zirconium octoate used in drying resin with cobalt octoate the hardness of dried film increase with small amount of hydrocarbon resin in varnish industry. Impact resistance results are given in TABLE 4 the two resins prepared using lithium hydroxide and zirconium 2-ethylhexanoate catalyst dried films show significant improvements in impact resistance. The resin prepared from zirconium catalyst give good impact resistance this due to the zirconium element. TABLE 4. Impact resistance results. Results are given in TABLE 4 of two resin indicate the gloss of resin prepared zirconium catalyst and lithium hydroxide approximately like each other which means the two resin contains the same percentage of oil and polyester component which is responsible for gloss retention. Chemical resistance of dried film is given in TABLE 5. The resin A and resin B was good resistance to distilled water this due to low hydroxyl value present in alkyd resin and more cross-linked network results and the two resin completely unaffected with Nacl 10% for the same reason. 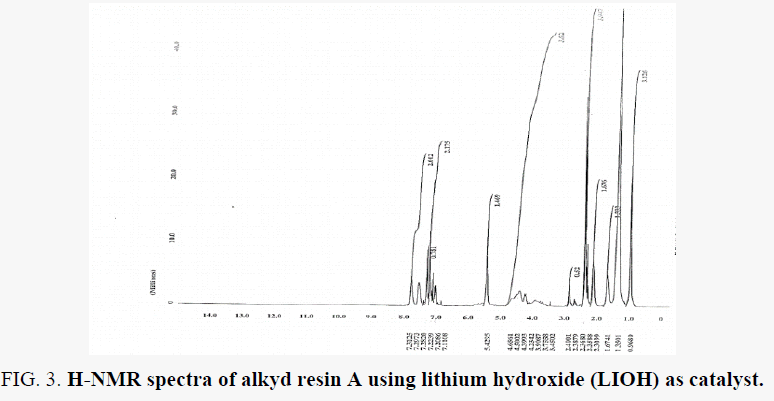 Poor alkali resistance of alkyd resin is due to the presence of alkali hydrolysable ester linkages and the alkyd resin containing a free acid groups which react with alkali. The two-alkyd resin unaffected with Hcl 10% this due to two resins contain acid number and ester linkages poor affected by HCl 10%. The tendency for alkyd-based coatings to yellowing is a common concern all over the organic coatings industry. [15,16] oils containing linolenic acid are subject to discoloration because it is known this acid is the main cause of discoloration [17,18]. soya bean oil contains 54% linoleic acid, so soya bean oil is good yellowing resistance where soya bean oil is widely used around world. the aim of this work the tendency of lowering yellowing across the preparation of monoglyceride using zirconium octoate to prevent autoxidation of oil and production of alkyd resin transparent after application on glass blend. The alkyd resin prepared from zirconium catalyst when applied in white lacquer was given good color and high yellowing resistance than white lacquer prepared from commercial resin . In the polyesterification reaction the acid value changes with time are shown in the FIG. 5. The results obtained in the presented work showed the ability of zirconium octoate salt to synthesized the monoglyceride from soya bean oil and glycerin by alcoholysis reaction and prevent the oxidation of oil at high temperature where the monoglceride formed in the absence of nitrogen gas inlet. The zirconium octoate salt can act as base –catalyzed transformation of triglyceride by glycerin to form monoglyceride under high temperature. The structure of alkyd resin was confirmed by FT-IR and H-NMR spectroscopy and comparable with the alkyd synthesized LIOH catalyst. The physic – chemical characteristics referred to the resin prepared from zirconium octoate salt was good yellowing resistance when formulated in white lacquer. the other properties were good like drying time, gloss. Gandini A. The irruption of polymers from renewable resources on the scene of macromolecular science and technology. Green Chem. 2011;13:1061-108. Thomas B, Michael L, Peter M. European Coutings Hand book. Erhan SZ. Industrial Uses of Vegetable Oil. CRC Press. Tuck N. Waterborne disease: Epidemiology and ecology. Technol. 2000;1. Gaykkar DV. Paint India solvent based alkyds. The Ir End User. 2001;55-60. Pramanik S, Sagak K, Konwar BK, et al. Prog Org Coat. 2012;75:569-78. Anthony GP. Introduction to paint chemistry and principles of paint technology. 3rd edn. Chapman and Hall. 1988;168. Akyenge B, Anhwange BA, Tageh GJ. Int J Mod Org Chem. 2012;61-6. Solomon DH, Swift JD. J Oil Color Chem Assoc. 1966;49:915-27. Aydin S, Akcay H, Guner FS, et al. Prog Org Coats. 2004;273-79. Wholf RH. Coconut oil modified alkyd resins and copolymers thereof with an alkyl acrylate. United States Patent Office 3,374,194 Patented. 1968;194. Wicks Z, Jones F, Pappas SP. Organic coatings science and technology. John Wiley and Sons, 1999;2:630. Taft RW, Newman MS, Verhoek FH. Esterification. J Am Chem Soc.1950;72:4511-19. Guthrie JP. Activation of methane and toluene by rhodium (II) porphyrin complexes. J Am Chem Soc. 1991;113:3941-49. Lazzari M, Chiantore O. Polydimethylsiloxane thermal degradation. Polym Degrad Stabil. 1999;65:303-313. Kockritz A, Martin A. Applied homogeneous catalysis with organometallic compound. Eur J Lipid Sci Technol. 2008;110:812-824. Warwel S, Rusch gen klass M. Chemistry of fatty acids. Lipid Technol. 1997;9:10-14. Dobson G, Christie WW, Sebedio JL. Advances in lipid methodology. J Chromatogr. 1996; 723:349-354. Asemani HR, Ahmadi P, Sarabi AA, et al. Effect of zirconium conversion coating: Adhesion and anti-corrosion properties of epoxy organic coating containing zinc aluminum polyphosphate (ZAPP) pigment on carbon mild steel. Prog Org Coat. 2016;94.